Call this adorable cabin your home away from home for your next North Shore getaway. Northern Lights Cottage is a darling 1-bedroom, 1-bathroom cottage located near Grand Marais, MN. The cottage is easy walking distance to many Grand Marais attractions, including the North House Folk School and Grand Marais Harbor. Come and stay The large, private back yard backs up to the Boreal Forest making this a great North Woods retreat. The open living area offers a living room, dining room, and kitchen. Watch a movie on the flat screen TV or curl up with a good book on the futon. The futon in the living room provides an additional sleeping area. Whether you`re preparing a meal in the kitchen or watching TV in the living room the open layout will mean you never miss a moment with family. Enjoy a meal at the bar or... ... grab your bite to eat at the dining room table. There`s also an additional eating area outside if indoor dining isn`t your thing. The kitchen is small but well-equipped for all your meal prep needs. The fridge is located in the back entry way with access to the backyard. The bedroom features a queen sized bed. Enjoy plenty of natural light in the bedroom. Unpack your belongings and settle in. The bathroom features a shower/tub combo. Coming for an extended stay...Enjoy the use of the washer and dryer during your stay. Northern Lights Cottage- small but so quaint and cozy you`ll just fall in love. The back side of the house. The large yard gives you plenty of space for yard games. Or grab that bite to eat and sit down at the picnic table to enjoy a meal on a warm summer evening. Start a fire and roast some marshmallows for dessert. Listen to the crackling of the fire while star gazing. Northern Lights Cottage is an adorable, remodeled cottage located near Grand Marais Harbor. Nestled in town within walking distance to shops, restaurants, Sweethearts Bluff Nature Area, and the Lake Superior shoreline. This small but lively cabin is a guest favorite and has 1-bedroom, 1-bathroom, and a spacious yard. This is a great location if you are taking a class at the Grand Marais Art Colony or North House Folk School, as both are within walking distance and the walk is a lovely one with Lake Superior as your back drop. Come home and enjoy the nice backyard with room for games and a fire pit for roasting s'mores under the starry sky. If your goal is to have an adventure, you have come the right place! 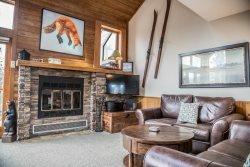 Being centrally located in Grand Marais you are walking distance to a short hike out to Artist's Point. Want a more challenging hike? Check out Judge C.R. Magney State Park, just 15 miles northeast, and the infamous Devil's Kettle, a mysterious waterfall that has captivated casual hikers and scientists alike. Or drive up the Gunflint Trail Scenic Byway for a day of hiking or mountain biking on Pincushion Mountain. Looking to just relax? Curl up on the couch in the evening with a good movie or just enjoy the peaceful ambiance that this home offers. Many dining and shopping options are also just a short walk or drive away. Whatever your goal was when you set out for the North Shore you are sure to find it at Northern Lights Cottage. Pets are welcome with prior approval and an additional fee. 2 pet maximum. For families with pets and small children please note that this home is located on Highway 61. Fantastic home. Very comfortable, cute and relaxing. Love the big back yard!! We played some lawn games and had more than enough room. The fire area was wonderful as well. It appeared to be very dog friendly. We wish we would have brought ours. They would have loved it too. The home was so much more than expected! Location was good for a short walk to downtown. Washer and dryer was a huge plus. Dog friendly also awesome. This was the cleanest cabin we have stayed in so for. We felt like it could be our home. Everything was great...So well-equipped and clean. We expected it might be more remote and on the lake or with a view, but maybe that's just because we wanted that. However our visit was super anyway. Loved this cute cottage in Grand Marais. It had a well equipped kitchen, even nicer dishes and faucets than I have at home! We made use of the cool fire pit out back and the Netflix connection. We weren't able to get the internet connected, but that was probably for the best. Also so nice that this was a pet friendly cottage. We will be back! great location, clean & nicely furnished. Just off hwy 61 so there was some highway noise.